Such a great idea! Let me write that down…. Have you ever had the experience of going over your scribbled notes later, only to wonder what the heck you meant by that? I have. Want to know more about getting the most out of NARTS Conference? Click or tap the notebook! 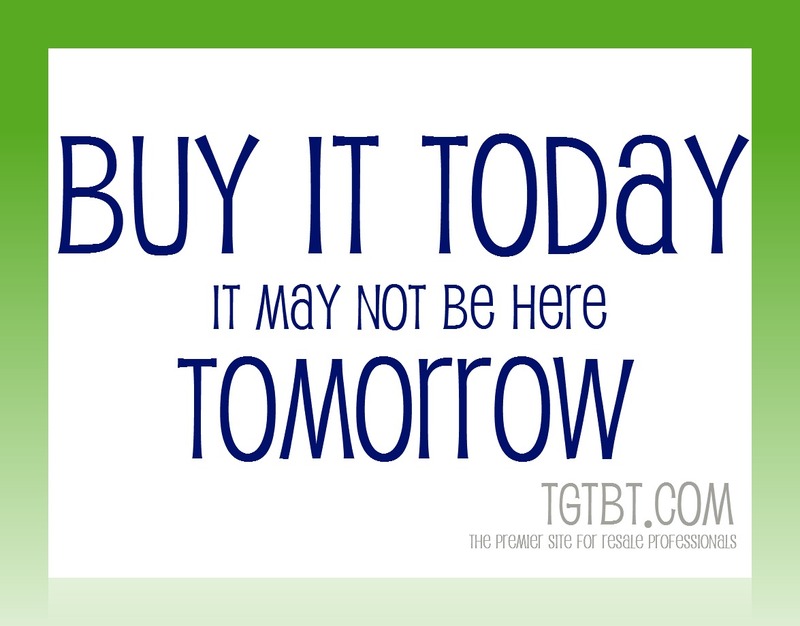 After all, you don’t want to let a good idea slip away! The NARTS Conference Bus Tour is one of the most popular activities at Conference, and for good reason: you get to see, first-hand, the looks, layout, and operations of local shops, you get to ask nosey questions, and each shop generally has a few goodies for us! 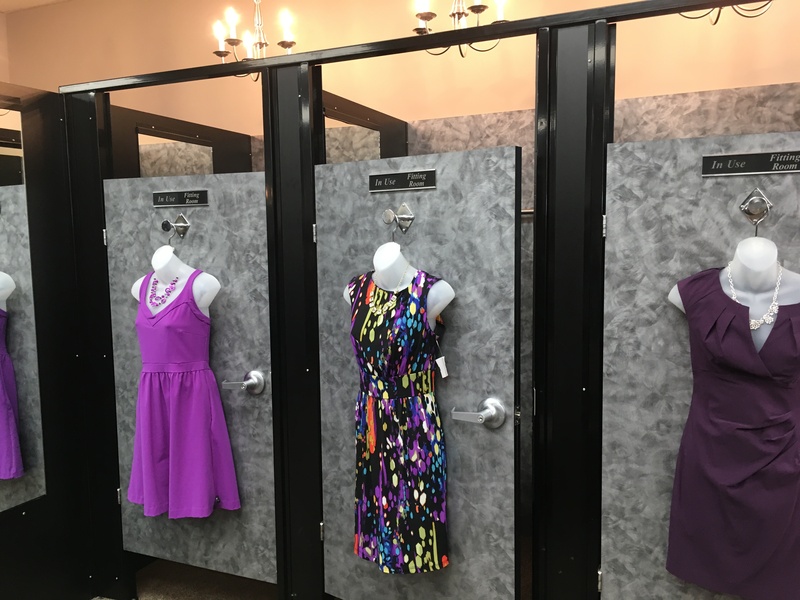 Professionally designed dressing rooms with color-coordinated displays. 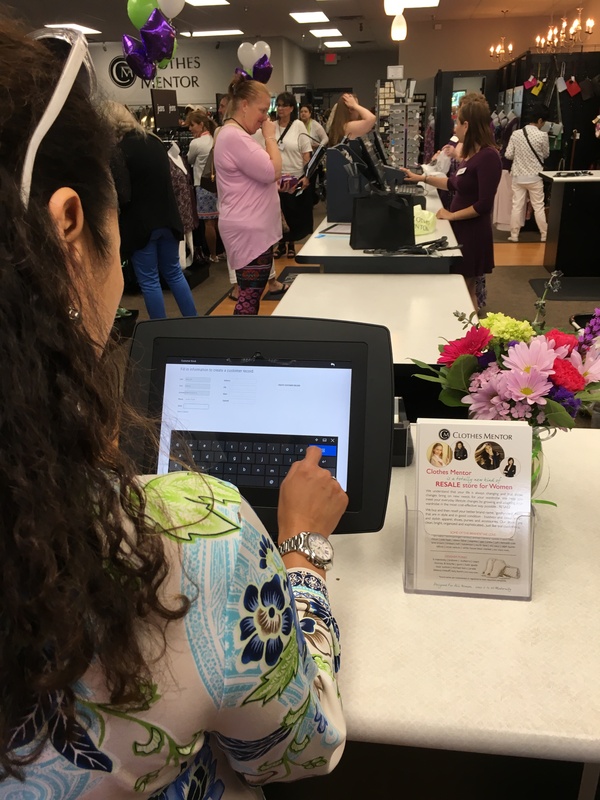 Here, a first-time seller fills out her info electronically before showing staff her items. Saves staff time and makes the seller feel invested in the relationship from the start. Clothes Mentor offers a variety of resale shops in their franchising. 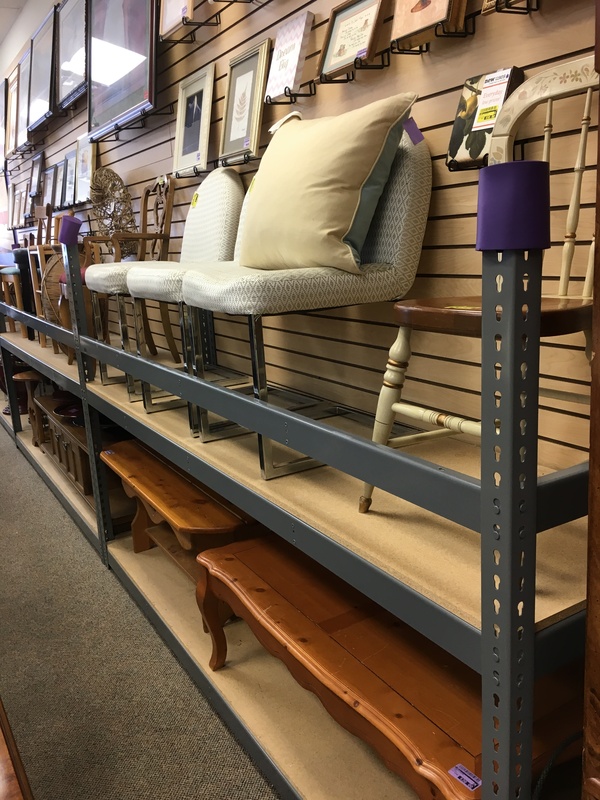 The next bus stop included Children’s Orchard, Device Pitstop, and NTY Clothing Exchange, as well as New Uses, a furniture, home decor, and everything-else-you-can-imagine shop. Barely one step up from the traditional merchandise mix of donation charity shops, I was fascinated by racks of CDs, Big Box “artwork”, and more. My favorite find? 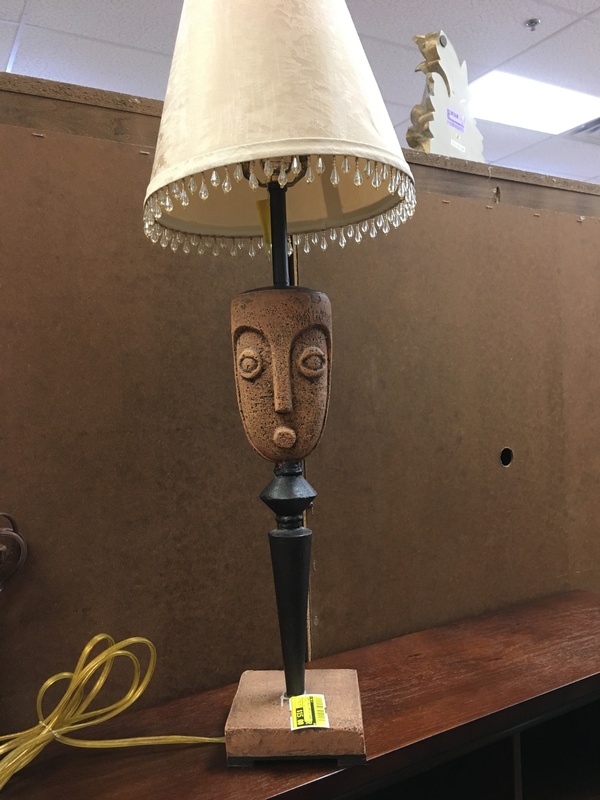 Where else would you find a lamp like this? 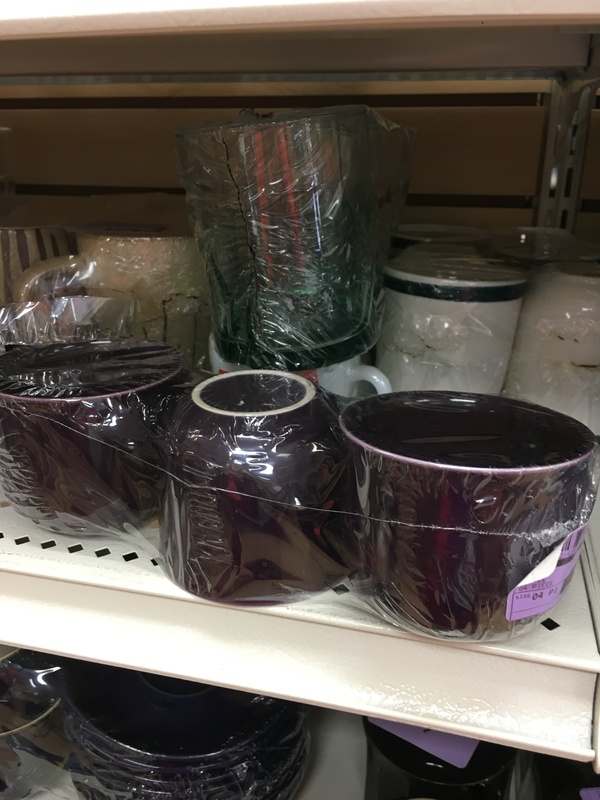 I’ve never seen shrink-wrapped mugs and glasses before… but why not? 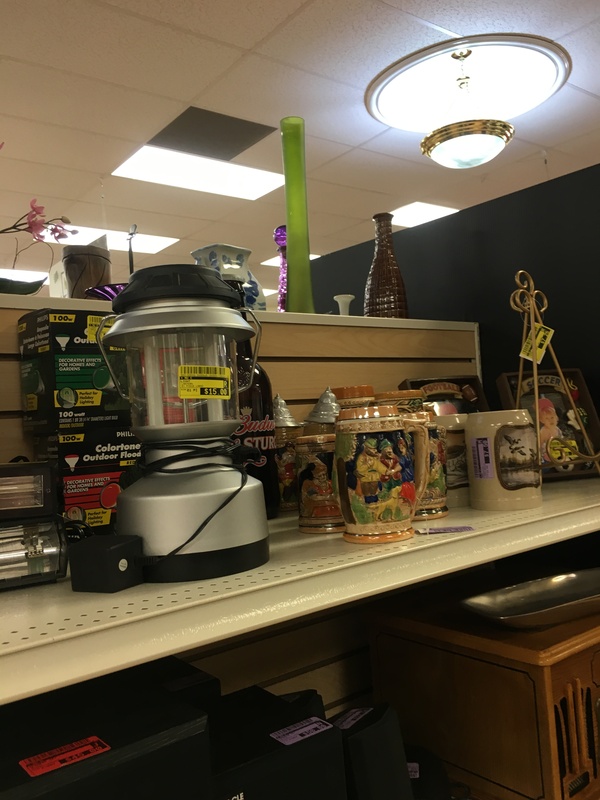 For the record, I regret not buying the Bedazzled Tiki lamp. That’s the end of the official NARTS Conference Bus Tour, but stay tuned for a private tour of a phenomenal shop that has more square footage than there are souls in her town! Subscribe on our sidebar to get email whenever TGtbT.blog adds a new post. Read Part I of our Bus Tour. And Part II. The next stop on our NARTS Conference Bus Tour was a bonanza of ideas from two shops owned by the same company, Turnstyle. First, their clothing shop. It’s on the inside elbow of an L-shaped center, within 100 feet of their home furnishings store. Although there is excellent overhead signage for motorists, pedestrian-level signage is missing in both cases, and I did actually hear some of my bus companions exclaim that they totally missed the tucked-away clothing store. Remember, click any photo to enlarge. A whole wall of accessories, neatly arranged. Notice the narrow mirror, hung sideways above the jewelry. Notice that scarves and jewelry are hung not on straight arm slatwall fixtures, but on waterfall faceouts for easier browsing. I loved their devotion to colorizing. Don’t the belts look great… and colorizing shoes is something I seldom see! The shop does carry a selection of childrenswear, sizes 2T and up, and some menswear as well. Plus size womenswear has its own floor space as well. The cleverest idea I picked up at the clothing store was this: Spring-summer clothing is tagged with green tags, fall-winter with red tags. This makes it simple, at seasonal clearance time, to simply say “50% off all green ticket items”, without having to rearrange the shop or put stamps, stickers, or hole punches on each tag. 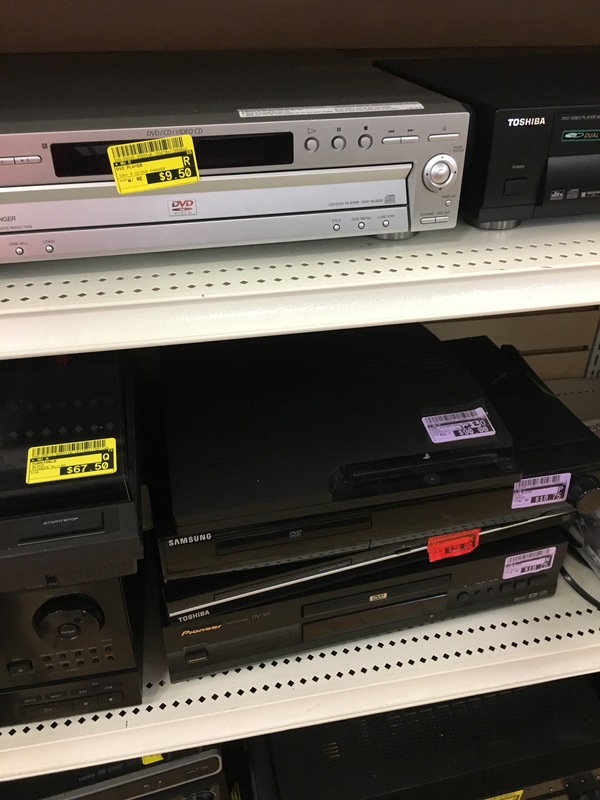 Here’s the shop’s post-dated consignment goods awaiting the seasonal switch. Note they have red tags, allowing the shop to intersperse some transitional goods into stock without affecting the green-ticket clearance event. What to do with too much wall decor? I’ve seen plenty of solutions, but these carpet-covered, stepped units are elegant in looks and function! Stay tuned to our blog… Part III of the Resale Bus Tour at NARTS Conference coming up soon… and another shop a few of us were thrilled to visit on our free evening! See Part I of the Resale Bus Tour. Visit turnstyleconsign.com for more on this company. One of the most fun parts of NARTS Conference is always the Resale Bus Tour, where we descend en masse at willing NARTS member shops, poking into back rooms, eating cupcakes, asking questions and shopping! Getting ready to join your peers and learn? I’m busy making lists, packing supplies, and practicing my workshop. Gathering resources I think the folks I meet and chat with and eat and drink with might like to have. Don’t forget to check which Products for the Professional Resaler you already have. And download what looks interesting… that way, you’ll have a chance to read it before Conference and, if you need to, ask for clarification or for how you could adapt, say, a promotional idea that catches your eye, or a way of handling clearance sales or using your space better, to your specific shop situation! PS: If we don’t happen to meet in the course of Thursday, Friday or Saturday, I’ll be in the front of SourceMart on Sunday just for the first hour, from noon to 1pm, signing the Manual. Brings yours if you’d like me to sign it, pick one up if you’ve never treated yourself to this business tool… or just come chat! A gentle suggestion for those shopkeepers who will be attending NARTS Conference this week: Aim to return home with both a MENTOR and a MENTEE. and one person for whom you can do the same. you will continue learning even long after Conference. Even if you do not find a given acquaintance to fit either of these categories, chances are that, using this goal, you’ll interact in ways that benefit you both. And by benefiting you both, you will also be benefiting the industry as a whole. The better we each are at resale, the better reputation the resale industry will have as a whole!